Come on you lot,not very often this happens nowadays. If the dates work,I am always up for a ride out. If I can throw a couple of dates in:- May 14th, June 18th or 25th. What d'ya think ? yeh that sorta time,got to wait till football season finishes-my kids play for teams,my son's games are on sat and my daughters are on sun-and i hate the bloody game!!! I live in Brighton so not close but would be interested to know more. I will be away for Le Mans, Silverstone and Assen Moto GP so if around these unfortunately I won't be available. morpheus20170 wrote: I live in Brighton so not close. I'll answer this later on when I know what's going on work wise and what I've already planned. there are some beds on a 1st come basis,i do have 2 camp beds,u probably will need a sleeping bag as i have some quilts. just to let u know,i have 2 german shepherds,friendly but do bark but once u have made friends with them they are fine plus they make gr8 guard dogs fer the bikes lol!! well bloody well fix it!!! Just over 4 weeks to go and still......no takers???? Thanks for the kind offer Mate, I'll have to sit this one out tho as ive promised the grandson some fishing/camping time. I will let you know this Saturday need to see if I can get fri, sat and Sunday nights off work, If It's good I'll stay the Saturday night. Bed or floor don't mind but I'm not sure I want to sleep with the dogs, they may get the wrong idea if someone calls me bacon! My bike(s) : Does a push bike count? C'mon you lot its also his Birfday "DO" now you really know who your friends are!!!!! 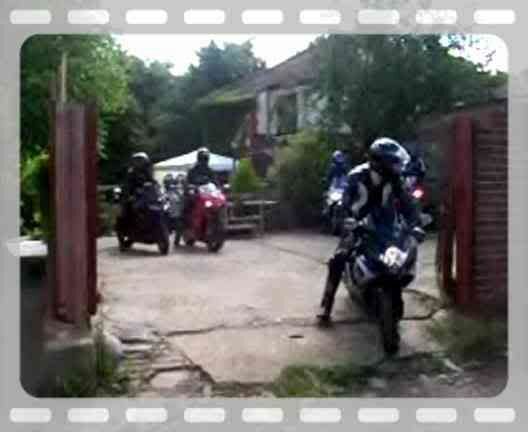 Look at the hospitality and generousity, bacon sarnie and cuppa on arrival, all day rideout, BBQ 'n beers plus FBR members meeting up for the first time does'nt come any better. Will try and muster some interest from down South Si. Sounds good to me I will be up for it ! I,ll be there for sure!